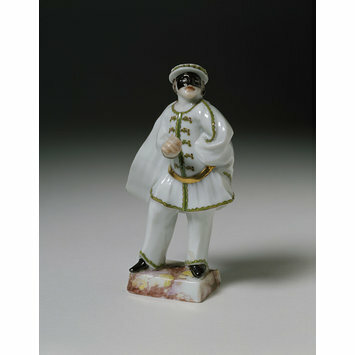 Figure in hard-paste porcelain from The Italian Comedy, painted with enamels and gilded. He stands with his right arm held forward and he wears a black mask and flat cap, full-skirted jacket, cloak and trousers. Square low base marked with brown and yellow. 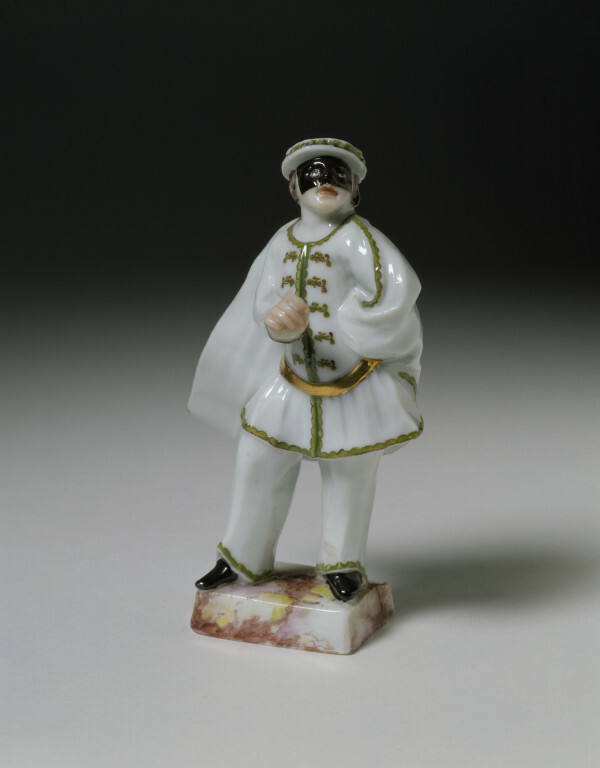 This figure of Brighella, once attributed to the Cozzi factory by Morazzoni and by Lane, is actually part of the series of Commedia dell’ Arte characters made by the Ginori factory at Doccia during the First Period (1737-1757). Like the other Commedia characters, at Ginori the figure of Brighella was made in two sizes: a smaller size which corresponds to the measurements of the figure shown here, and a large size which was slightly over 20 cm tall. A list attached to the warehouse inventory in Livorno in 1757 mentions “a Brighella of the Commedia Italiana 9 soldi tall, not perfect” which would correspond to the height of the larger version. Like the other Commedia figures made at Doccia, Brighella is quite similar to an engraving by Martin Engelbrecht made around 1740 and to the Commedia figures being Executed at the Viennese porcelain factory between 1744 and 1749 (STURM-BEDNARCZYCK, SLADEK 2007, p. 180, cat. 284). For further historical information, see cat. 33.